Who said anything about location-based services being dead? Because they’re not…and you better hold onto your hat, because one of the more well known services has just released an update to its iOS app. Starting today, users of Highlight will get better/enhanced profiles, relevant notifications, high fives, and much more. And there’s just one more thing: it’s now available for Android devices. Having launched in January and making its grand debut at South by Southwest, Highlight says it’s ready to take the stage in its third act. And while you might think of the service along the same route as Banjo (which recently announced its own news), Glancee, Sonar, EchoEcho, and many others, co-founder Paul Davison tells us public perception about it is all wrong — it’s not about meeting people, but rather about how the world sees you. Highlight is hoping that people will use the service in a way where they can visualize walking by others and seeing one page of information floating above their head. 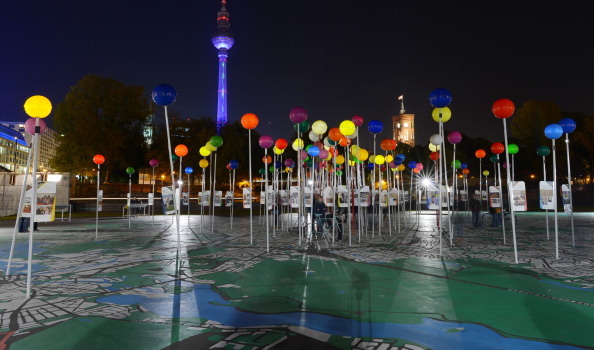 The idea, Davison says, is to share what you’d want people to see if you had a blank slate. With this update, users will find that there are new ways to share, consume, and interact with the content and people. Armed with an updated design, new buttons, backgrounds, navigation controls, animations, and what it says is “cleaner overall aesthetics”, the company hopes that people will find it more useful and more engaging than ever before. Compared to other services, Davison says that Highlight isn’t focused on the places, but rather the people. Everything that we ever learn about others is through anecdotes and through context — we find them valuable and interesting for random facts and stories. Keeping this in mind, the company chose to make some adjustments in how the profiles are displayed in the app. Within the profiles, the header maps have changed so when you’re looking at someone else’s account, you’ll be able to see an animation of your last encounter with them. Additionally, the company says it has expanded the summary area of the screen so that you can now share your hometown, school, and relationship status with others (that is, if you want to). A new section called “Things about me” has also been added to profiles, which is where you can tell others random things about yourself. Think about it as almost like a Facebook Wall — not only can you post content about yourself, but others can post stories and things about you, something similar to LinkedIn recommendations. 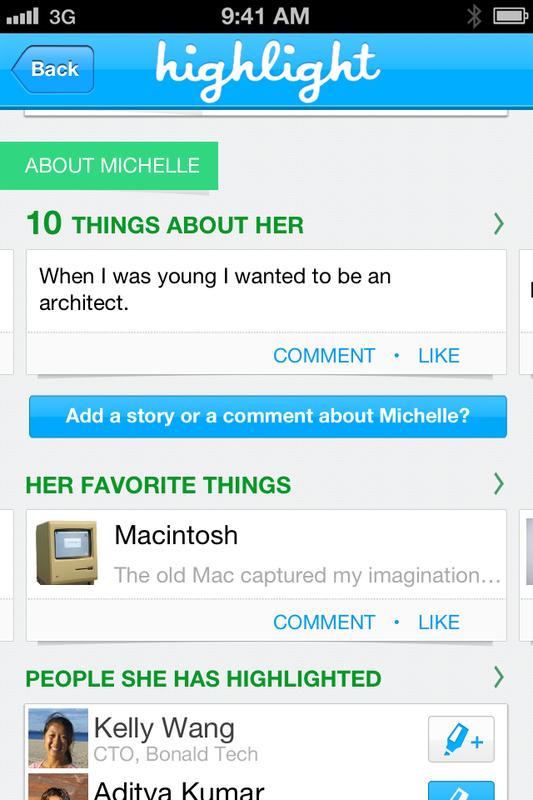 Sharing more information about your interests and what you like is also new to Highlight. Now you can create visual lists of your favorite things while also making recommendations about apps, bands, restaurants, etc. Davison says that with the previous iteration of the profile, he discovered that there were people who wanted to talk about things they like and therefore the service added in this feature, which imports the Facebook Pages you’ve Liked, while giving you the freedom to add others and tell why you love it. Because your profile is basically a billboard of information about you, the retail space shouldn’t go to waste by not helping you get something out of it. That’s why the new profile includes a “Let me know if” section that enables users to share requests with people around them and collect responses throughout the day — so if you’re looking for a designer or developer for your company, a babysitter, or anything else, there’s a field for that. 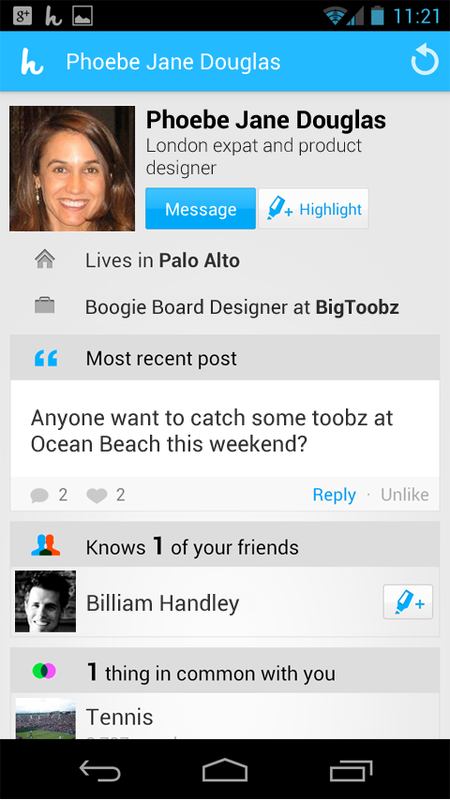 Lastly, all Highlight profiles now can be connected with Twitter, Facebook, LinkedIn, and Foursquare accounts, importing additional content when needed. However, all information is pulled into the app, not pushed back out. Chances are that when you meet someone, you just might have something in common with them — it could be mutual friends, interests, etc. When this happens, common human behavior is to congratulate them on the mutual interest. In Highlight, it’s now called a high five. 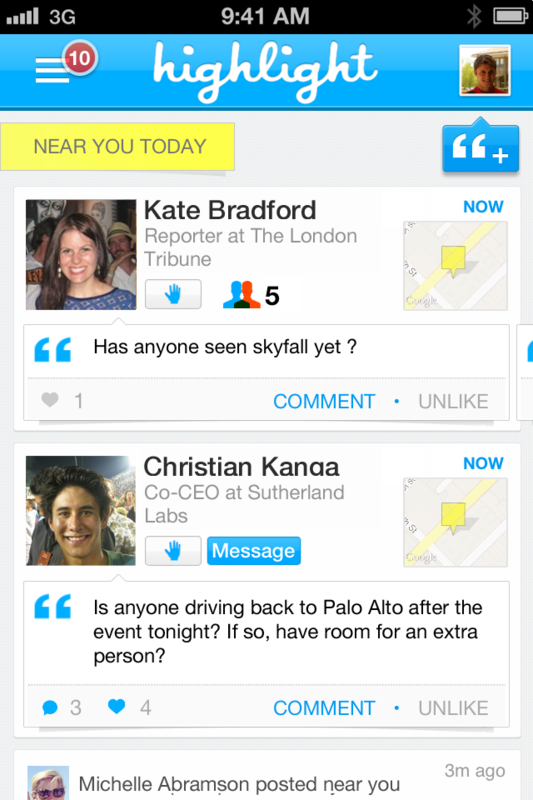 You might think of it as being similar to Facebook’s poke or Like, but a lot less creepy. Through the activity feed, you can send a high five to anyone and in seconds, an audible sound should be heard on the other person’s device. Davison says that it’s a friendly greeting with no expectation of a reply, plus it’s more private compared to Liking something. 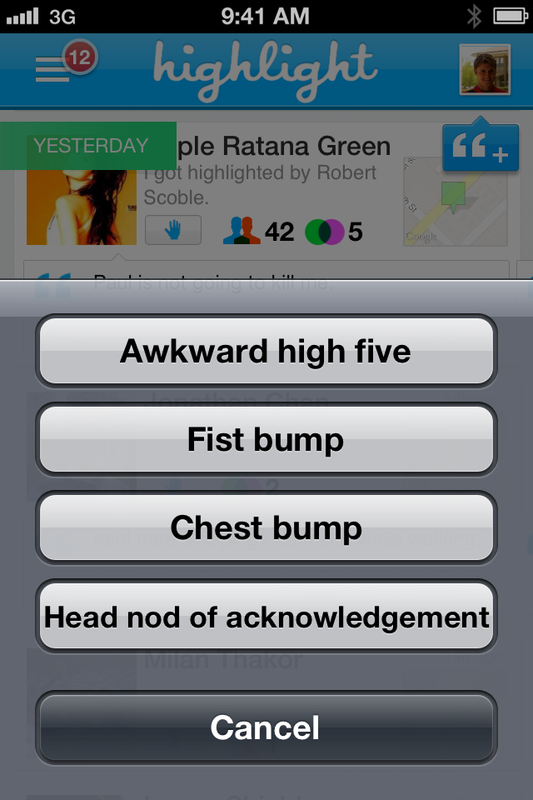 Highlight did add a bit of an Easter egg into its app so that if you press and hold on the button, a pop-up menu will appear enabling additional “actions” that can be taken, including giving an awkward high five, a “chest bump”, a “fist bump”, or simply a “head nod of acknowledgement”. Davison says that these actions are all populated right from the server side so additional actions could be added in the future. One of the things that Highlight says it’s trying to do is cut down on the amount of noise that’s generated from notifications. So they’ve rebuilt the system so that it generates fewer, but more relevant notifications, complete with custom ringtones so you can recognize them over your phone, email, SMS, and more. Davison says that the goal is to ensure that every time you receive a notification, you’re going to be excited about it and you will discover new content from it. It should be something that you would want to take action on. Through the use of click-through rates, retention rates, and anecdotal evidence, the app will know what notifications to send over — in addition, a complex algorithm and mathematical computation process has been utilized in order to help make, what the company says, the experience better and better. While your Highlight profile is perhaps the most important part of the service, the activity feed is your reference of those around you. Davison wanted to put together a system whereby the individual was the center of attention, not their activity. This was something that separated Highlight from Facebook. With this update, when you look at the new activity feed, you’ll see the same person over and over again, but all you need to do is cycle through their activity while also viewing a bunch of other information about them so you can learn all about them right from a single screen. The service lets you visually scan your feed to find your friends, but also enables you to message them right from the activity feed — formerly, this was only available by clicking through to their profile. One of the things Davison kept telling us was that he wanted to help find a way to add value to the world — he believes that Highlight is going to be able to do this and that there’s no other service doing it right now. We asked him about what dissenters and critics say about Highlight — “Who uses it?”, “Is it still around?”, etc. — and he says that the product is different from all the rest. You aren’t publishing things and there’s no friend/follow model that people have come to expect from social apps. When asked about the hype surrounding location-based services, Davison says he doesn’t like it — for him, SXSW wasn’t about getting the company into the spotlight to promote itself or gain publicity. He thinks that it’s too early for a celebratory touchdown because right now, Highlight is in the early days of this space and he thinks that it’s not one to really take off that quickly. The company has grown in terms of staff over the past few months. Having only two employees up until July, it recently brought on board several more to help build this new version, along with its Android version, which is available now through the Google Play store.